This is the perfect gift set for the gourmand in your life. A showcase of our best culinary offerings, these delicacies are staff favorites and Randall's top choices alike. 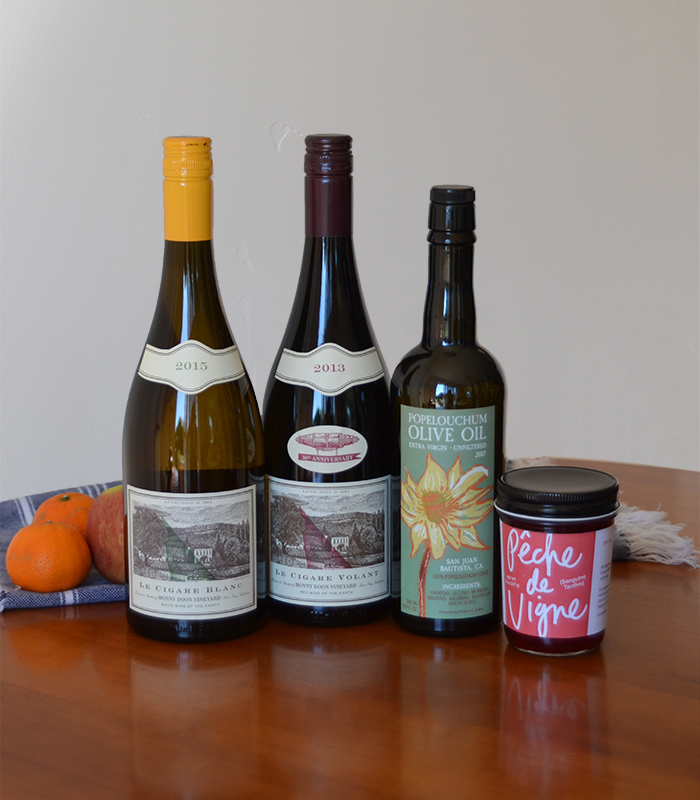 Our flagship wines match beautifully with our rare Pêche de Vigne jelly and estate olive oil; both products are limited production treats from Popelouchum, our estate vineyard in San Juan Bautista, CA. This is the perfect gift set for the gourmand in your life. Just add your favorite local cheeses and charcuterie, plus some artisan bread or crackers, and you'll have a spread that your guests are sure to love. Click here for an enlarged image of pack detail. Typically interplanted in vineyards, pêches de vigne provide welcome sustenance to grape harvesters. Gray and dusty on the outside, they are blood-red on the interior and possessing a rare, haunting fragrance. Try this gorgeous jelly with Bellwether Farms sheeps milk ricotta, Cypress Grove's Midnight Moon, or Cowgirl Creamery's Inverness. Spicy and fruity, this olio nuovo, or “new oil”, is fantastic as a finishing oil, or even for dipping with bread (just sprinkle with a little sea salt). Drizzle onto crostini and pop in the oven to crisp to a golden brown, or sprinkle over mixed olives - but we won't blame you if you find yourself wanting to drink it! 55% Grenache Blanc, 36% Roussanne, 9% Picpoul · The wine is rich and elegant at the same time – great persistence on the palate but with a refreshing acidity and a slightly chalky mineral aspect. Rich and luscious, there is plenty of glycerol and non-trivial extract present; Le Cigare Blanc remains a great vin de gastronomie, pairing well with rich, buttery dishes. A lovely wine to pair with a large array of cheeses. * Offer does not include sales tax or shipping fees. Club members must be logged in to access their discounts; please call 888-819-6789 with any questions or for assistance.